We have recently begun receiving a large number of complaints from our readers regarding Global Authentication's lack of customer service. We recommend using either PSA or SGC and avoiding Global Authentication if at all possible. When card grading and authentication company Global Authentication (GAI) ran into financial trouble in early 2009, it attempted to file for Chapter 11 bankruptcy. But a judge threw out the filing, forcing it to find another option to continue operating. Part of the solution was to sell off the card grading arm, which was reborn under new management as a new business called Global Authority. Run by CEO Demian Werner and Director of Grading Mike Baker - who once served in the same capacity for industry leader PSA - Global Authority has plans to leverage the value of the old GAI name while adding some of its own wrinkles to the graded card market. Its services include grading single sports or gaming cards, grading upopened packs of cards, and consigning memorabilia items to auctions through its Global Passport program. Similar to other top grading companies, Global Authority uses a ten-point scale to describe the condition of a card submitted for grading, with half-points also used for further differentiation. Centering, the sharpness of corners and overall eye appeal are the three main criteria considered by Global's graders. 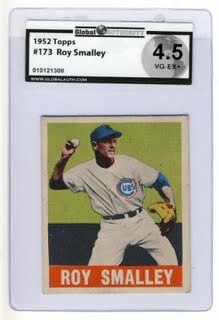 Graded cards are sealed inside tamper-proof holders, and the company claims it has the widest variety of holder sizes in the industry. Global Authority will also issue a dual certification for cards previously graded by another company, essentially offering a second opinion for greater peace of mind for the owner. In these cases, the Global label is attached to the back of the holder used by the initial grading company. Collectors have to be members to submit cards or packs to Global Authority for grading, but the Basic membership level is free. Premier and Premier-Plus members must pay annual fees but receive numerous benefits, including a number of free submissions each year. Global Authority accepts submissions for grading by mail from anywhere in the world, and collectors can also drop cards off in person at the company's Iowa headquarters. Company booths at sports cards and collectibles shows accept submissions, with some also offering on-site grading.